The first reconnaissance in the world of quadralectic architecture will be in the realm of the open, outside and pastoral, or – more in general – the ‘natural’ type of architecture. The choice is not inspired by some sort of hierarchical inclination. Architecture does not have a beginning (and neither an end). Architecture only has a phase of visibility, like every other physical reality in a communication. Phases of visibility, depending on the type of division thinking, that is the hallmark of the quadralectic outlook of life. The crucial question is: what do we – as an observer – see at a certain moment and at a certain place? And the answer to that question will give an immediate answer to the question of what we are (also at that particular place and moment). The landscape is a suitable place to start the unbounded story of quadralectic architecture. The landscape is neutral, like the First Quadrant. Everything is possible. However, the architecture of nature – if left to its own – often uses a time scale, which surpasses the human understanding. The changes of physical properties in time can be measured in geological eras or as instant moments of visibility. Both quantities are hard to understand. The interference of Man is either minimal (on a large scale) or takes on a dramatic proportions (in which the word ‘drama‘ is used in its original Greek meaning as a religious observance). It has to be remembered that the Greek drama started as a tribute to Dionysus, the god of both spring and the vintage. The spirits of the season (both literal and metaphorical) gives to man the power to rise out of himself. We call this power today enthusiasm, meaning in Greek the god within us. .
Landscape is the ultimate form of enthusiasm or a lust for life. The awesome beauty of the landscape is worship to the god within us. This basic principle came to the foreground in the Romantic Movement, which started at the second half of the eighteenth century. The rolling pastoral landscape, the meadows, ponds and lakes, grazing cattle and deer herds and dead trees: they all lost their innocence and became elements in a new way to look at nature. Visibility gained a higher dimension. The landscape became ‘picturesque’, like a picture, with different layers of interpretation. The English schoolmaster and clergyman William Gilpin (1724 – 1804) defined the Picturesque as ‘expressive of that peculiar beauty which is agreeable in a picture’. He looked in his second essay On Picturesque Travel (of a total of Three Essays on Picturesque Beauty, 1794; BUDGE, 2001) for the effects (rather than the causes). A ‘pioneer of the picturesque’, as he was called in the Oxford Companion to Gardens, saw of its main object (of travel) the search for beauty. A second intention was the source of amusement (in the pursuit of something new and the attainment of the object) (BARBIER, 1963). An interesting representative of the developments around the year 1800 was Richard Payne Knight (1751 – 1824). This freethinking Deist philosopher illustrated his poem ‘The Landscape’ (1794) with two engravings by Thomas Hearne, showing the change from a Palladian house in an unnatural environment to a Gothic house ‘dressed in modern style’. Two years earlier William Gilpin had given a similar ‘development’ in his ‘Three Essays’ (fig. 13). The poem of Knight mocked about the ‘smooth’ and unadventurous style of Lancelot Brown (1715 – 1783), also known as ‘Capability’ Brown. Brown was eager to show his clientele the capabilities of improvement of their gardens. His hallmark was a serpentine shaped lake. The difference in garden design between Knight (the natural, picturesque) and Lancelot Brown (the unnatural, curved) pointed to an essential change in division thinking towards the end of the eighteenth century. The use of the four-division came in vogue, not only in architecture, but in many other expressions of the arts and science as well. For instance, the Swiss physician and pedagogue Ignaz Troxler (1780 – 1866) developed – around 1800 – a medical model based on the tetractys (TROXLER, 1812/1985). The four components – the spirit (Geist), soul (Seele), body (Leib) and human beings (Körper) – were regarded as a unity (HEUSSER, 1984). Fig. 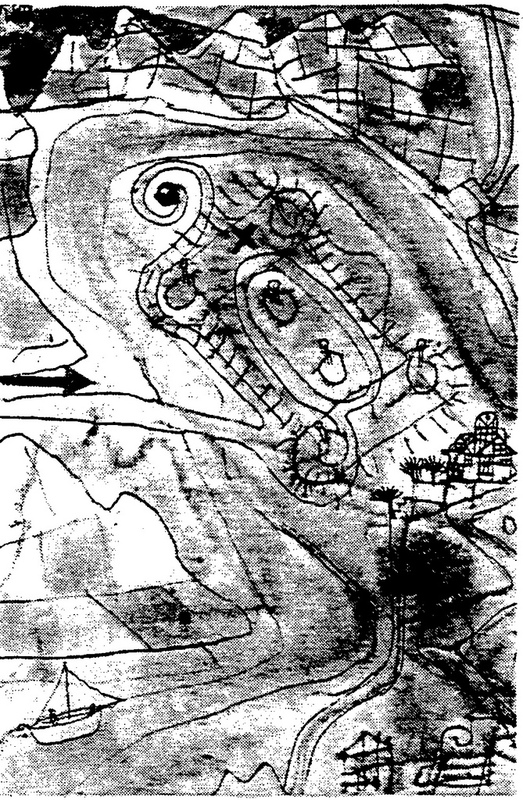 13 – The development of a dressed garden from a barren countryside. The upper two aquatints are from William Gilpin’s ‘Three Essays’ (1792). 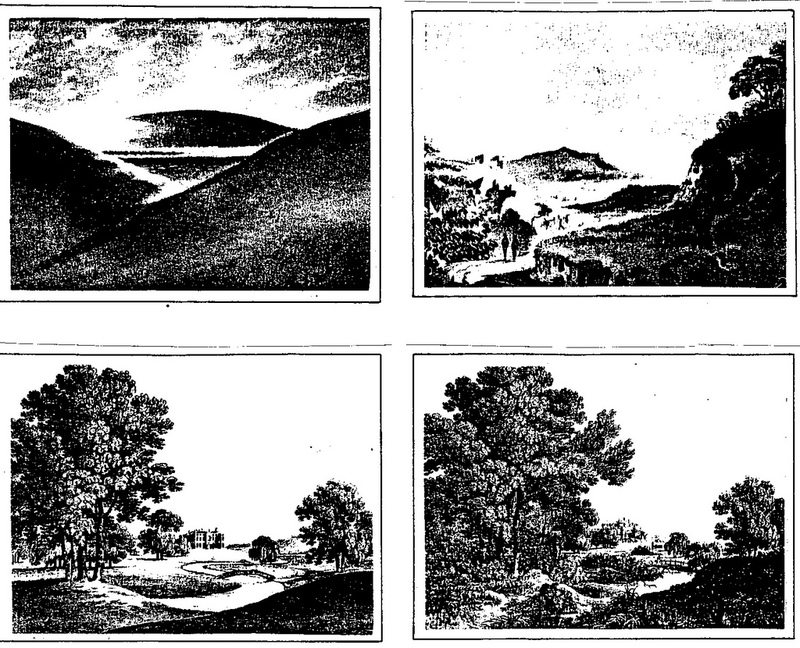 The lower two engravings by Thomas Hearne are given by Richard Payne Knight in his poem The Landscape (1794). Uvedale Price (1747 – 1829) had written an essay on the picturesque (as compared with the sublime and the beautiful). He stated, in the same year as Knight’s poem (1794): ‘Beauty and picturesqueness are indeed evidently founded on very opposite qualities. The one on smoothness, the other on roughness; the one on gradual, the other on sudden variation; the one on ideas of youth and freshness, the other on those of age, and even of decay.’ Edmund Burke’s idea of beauty was out, the picturesque was in. The picturesque dispute between Knight, Price and Repton was mainly concerned with the influence of the irregular. The problems related to the regular and irregular are typical for the mental boundaries in division thinking. The lower division setting can only deal with the end members of this polarity, while the higher division can see the intermediate stages. The linear advancement – as given by Richard Payne Knight – from a barren nature to a dressed landscape is an effort to bridge the gap. The linear setting, however, still points to an oppositional inclination. The English artist Alexander Cozens (1717 – 1785) played out this same controversy of the regular and irregular. He was one of the earliest masters of landscape painting in watercolor. He used a curious, almost visionary approach to cover the paper with ‘blots’, which were transformed into arbitrarily placed landscape elements. The attention to clouds was an intrinsic part of his work (fig. 14). Their composition and setting – as individual elements within a multitude – raised the same type of friction between the singular and the multitude and offered similar sort solutions as in the arrangements of landscape elements. Later, towards the end of the nineteenth century, the perspective of clouds raised a renewed interest of John Ruskin in his book ‘Modern Painters’ (1898; Vol. V). He tried to catch their shapes into curvilinear constructions. Fig. 14 – A composition of clouds by Alexander Cozens seen as an effort to conquer the boundaries between the regular and irregular. 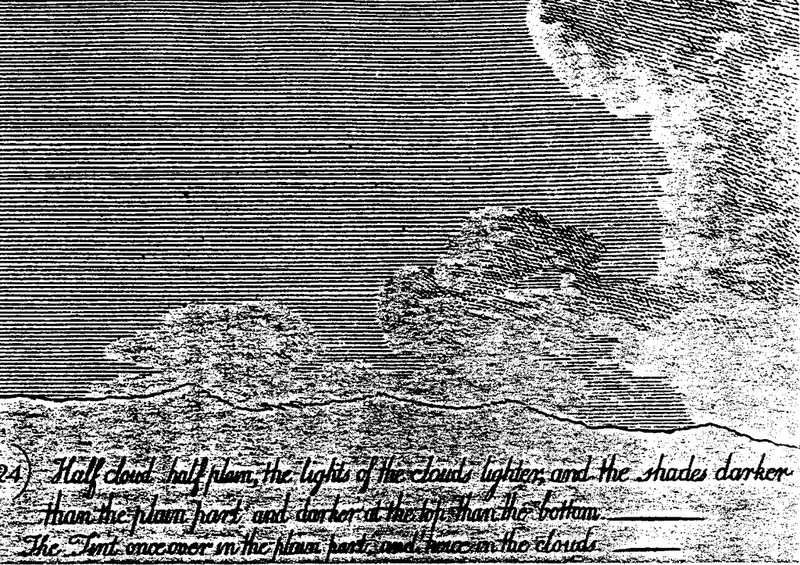 In this etching from his book ‘A New Method of Assisting the Invention in Drawing Original Compositions of Landscape’ (London, 1785) he explained the effects of distribution and intensity of the light and dark parts in the representation of the sky. The same theme was played out in his early, ‘impressionistic’, approach to develop the elements in a landscape from randomly positioned ‘blots’. Cozens’ work is like an exploratory journey into the borderlands of the visible invisibility, searching for the relation between the singular and the multitude. Humphry Repton (1752 – 1818), born at Bury St. Edmonds as son of a prosperous tax collector, had a ‘mixed’ approach to garden design. He invented the term ‘landscape gardening’. His theory involved ‘the united powers of the landscape painter and the practical gardener’. He carried on the work of Lancelot ‘Capability’ Brown (1715 – 1783). Repton and Brown rejected the formal geometric style of gardening for a more natural approach. They can be seen as ‘Fourth Quadrant’ representatives or fore-runners of an era in which ‘feelings’ (as the expressions of a human language born in nature) opened up new outlooks. Modern artists, like the Swiss painter Paul Klee (1879 – 1940), are still inspired by the archetypal idea of a square garden in a landscape (fig. 15). Klee had several paintings with gardens as subject (Remembrance of a Garden, Southern (Tunesian) Gardens). His prime interest in an ‘organized nature’ was clear. ‘In such paintings, Klee tried to give back to art a symbol that must have seemed lost forever in the nightmarish violence of World War I and the social unrest that followed. This was the Paradise-Garden, one of the central images of religious romanticism – the metaphor of Creation itself, with all species growing peaceably together under the eye of natural (or divine) order’ said Robert HUGHES (1991) in his book ‘The Shock of the New’. Fig. 15 – This water color by Paul Klee (1879 – 1940) was called ‘Landscape with a pleasure garden’ (1924). Paul Klee (1879 – 1940) – Zaubergarten (Magic Garden) (1926). Peggy Guggenheim Collection, Venice.